What a glorious Saturday it was last weekend! I awoke early and ran up the west side highway to the Union Square Farmers Market. I bought a chicken, asparagus, spring red onions, an assortment of shoots and baby greens, fingerling potatoes, a bouquet of lilacs, and, of course, ramps. On my menu for a ramped-up spring evening: spring salad, and pan roasted chicken with fingerling potatoes. First make the dressing so the flavors have time to blend together. In a jar you can close, like a mason jar, toss in 1 finely chopped shallot, the juice from one lemon, about 1/4 cup of olive oil (add more or less depending on your preferences) and season with salt and pepper. Close up the jar and give it a gentle shake, then set aside. Slice the roots off of the ramps, wash them thoroughly, and separate the stems from the leaves. Chop both into 1″ pieces. Sautee them in a little bit of olive oil, putting the stems in first and the leaves in afterwards. When they are tender, remove them from the heat and set aside. Pop the asparagus in a pot of salted boiling water and blanch for 2 minutes. Put them immediately into an ice bath to stop the cooking process. 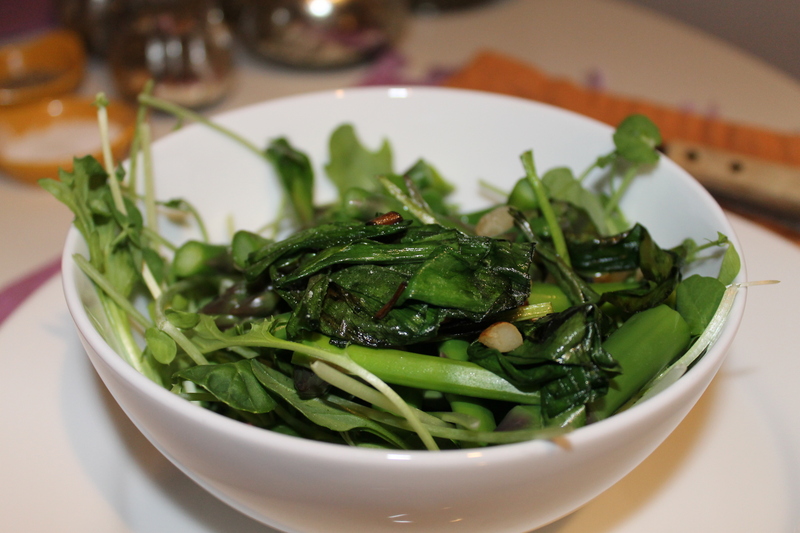 Assemble washed baby lettuces & shoots in bowls, top with bite sized pieces of asparagus, sauteed ramps, and the lemon vinaigrette. This skillet-roasted chicken recipe is one of the fastest and most delicious ways to make chicken. Put the chicken pieces in a large bowl, season with salt, pepper and thyme leaves, add the minced garlic, then drizzle some olive oil on top. Cover with plastic wrap and set aside. Arrange the fingerling potatoes on a sheet pan, drizzle with olive oil, and season with salt & pepper. Pop them in the oven for 30-40 minutes or until your desired level of doneness. Chop the roots off of the ramps and spring red onions and discard. 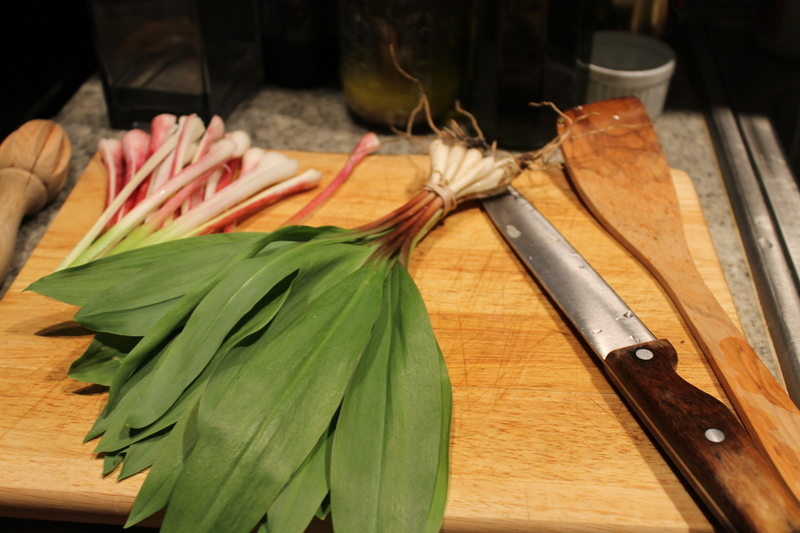 Chop the leafy tops off of the spring red onions and ramps, discard the red onion tops, set aside the ramp tops. Chop the red onions and ramp stems into 1″ pieces, toss them into a frying pan with a little olive oil and saute until they are crisp. In a large 10-12″ skillet (with a lid) over medium-high heat, heat up a little olive oil, and arrange the chicken pieces in the pan skin side down. Season with more salt & pepper. Cook for 10 minutes. Flip the chicken pieces over, put the lid on the pan, and cook for 15 minutes. Cut into various pieces of the chicken to make sure it is done, then put all of the chicken pieces on a plate under aluminum foil to rest. 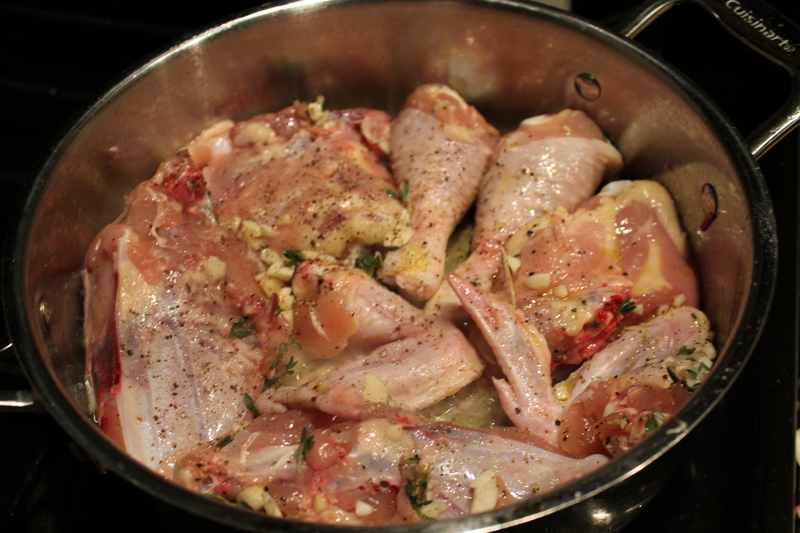 Pour about a half cup of white wine into the chicken pan, and scrape up all of the little brown bits. Add the ramp leaves and stir around until they are just wilted. Time to plate everything! 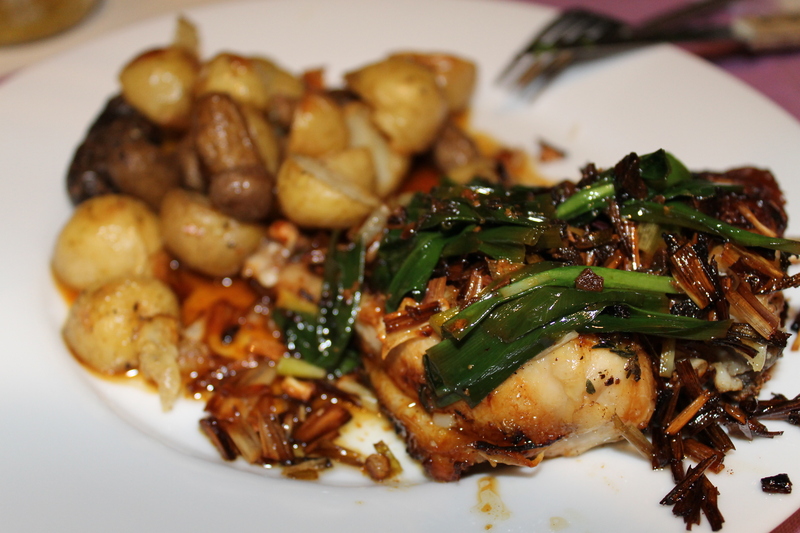 Put a couple of pieces of chicken and some potatoes on each plate, top with crispy ramps and red garlic and finish with the wilted ramps and pan sauce. This entry was posted in Farmers Market Finds, Garlic, Lemon, Local Food, Ramps, Thyme and tagged asparagus, chicken, dinner, dinner party, garlic, ramps, spring, thyme, union square farmers market. Bookmark the permalink.